Lazerow was a legal writing teaching fellow at George Washington University and spent two years drafting regulations, legislation and tax treaties with the U.S. Internal Revenue Service's Chief Counsel's Office. He taught at the University of Louisville and was a visiting professor at Université de Paris X Nanterre and University of California, Berkeley School of Law. He joined the School of Law faculty in 1967. The San Diego Mayor and City Council have appointed him to the La Jolla Shores Planning Advisory Board, a committee that advises the Planning Department on real estate development in La Jolla Shores. Lazerow was editor-in-chief of the International Tax Journal. 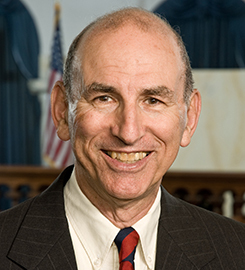 He is an elected member of the American Law Institute, where he has served on the tax advisory group and the members consultative groups for the restatements third of property, the U.S. law of international commercial arbitration, and the foreign relations law of the U.S., as well as the restatements of the law of charitable nonprofit organizations, copyright, and conflict of laws. “Holocaust Art Disputes” in (2018); “Art Resale Royalty Options” in (2016); Mastering Art Law (Carolina Academic Press, 2015); “Criteria of International Tax Policy” in 41 San Diego Law Review 1123 (2004); and OECD Draft Influence on U.S. Income Tax Treaties (International Bureau of Fiscal Documentation, 1976). Submit changes to Herbert Lazerow's profile.